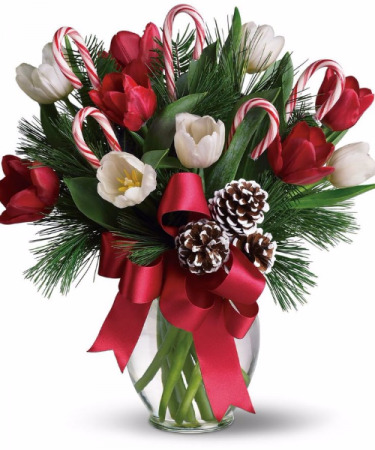 Holiday tulips with candy canes in a clear glass vase. 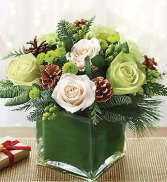 Green and white roses in a clear glass cube with pine cones and Christmas greens. 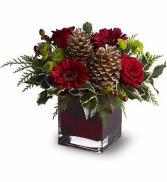 Christmas memories are made when we gather with family, friends and beautiful flowers. 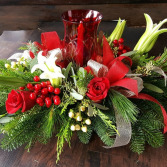 Festive red roses and wonderful white lilies are accented with red and gold ribbons. An elegant tapered candle in a glass hurricane shade completes this arrangement, which brings radiance to holiday celebrations.